solved the problem. Of course it took a fews days of googling to find the answer, which was on Ubuntu’s bug tracker (don’t have the link handy sorry). The issue I had was that if I tried to change the theme or any part of the appearance of Gnome, the whole theming application would go blank. If you expierence this too, remove gtk-qt-engine . Recent updates on Debian for Novell’s (formerly Ximian’s) Evolution E-mail programme added support for gnome-keyring. When you start Evolution for the 1st time after the recent updates Evolution will ask for the gnome-keyring password, then for your smtp password (password for your e-mail account). This can be a bit of a pain, especially for less experienced users. If your using GDM as your login manager (the login screen) you can install the libpam-gnome-keyring and have this done for you at login. Updated March 2008 with formatting changes. One of Gnome’s main philosphy is simplicity but in this endeavour, some things are a pain! 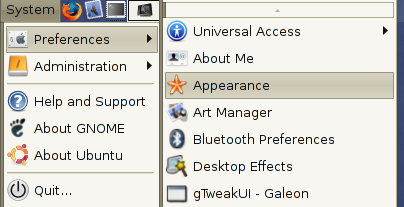 For instance, Gnome’s pictures screensaver doesn’t let you specify what directory to look for pictures or photo’s to display (nor has the neat zooming and paning features of Xscreensaver’s Glslideshow). It expects all your pictures to be in a directory named Pictures in your home directory and this isn’t an easily configurable option, and it seems to not look for pictures in any sub-directories of the Pictures directory (all the pics need to be in one directory). So once again I can use the Glslideshow screensaver without having to disable Gnome’s screensaver and configuring xscreensaver to auto start when I login. The only problem with this is I need to use the xscreensaver-demo command to configure xscreensaver’s screensaver. If you do this make sure you don’t start the xscreensaver daemon. Gnome Fonts too big in Ubuntu Gutsy? I upgraded my Dell 700m laptop from Ubuntu Feisty to Ubuntu Gutsy. Gutsy is the current developemnt (beta) release of Ubuntu Linux and is planned to be released in October of 2007. After upgrading to Gutsy and restarting my laptop many of the fonts were too big. Note: Your fonts may be different than what I have set. 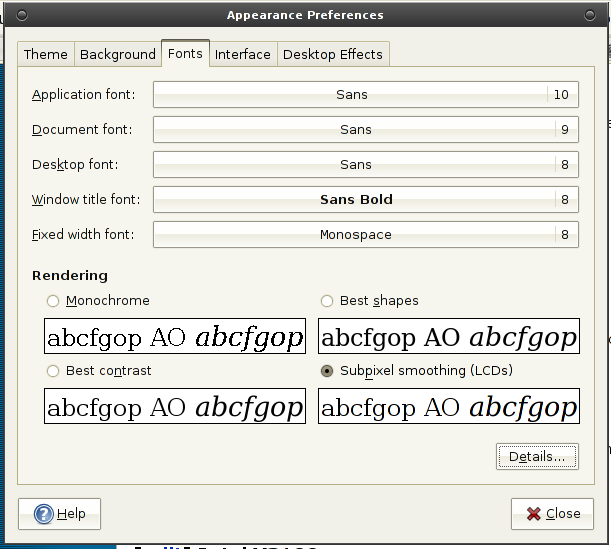 You may need to logout and back in again for fonts to change for all of your running applications. Also, if you don’t have a LCD display you will not want to have “Subpixel (LCDs)” enabled like I do.